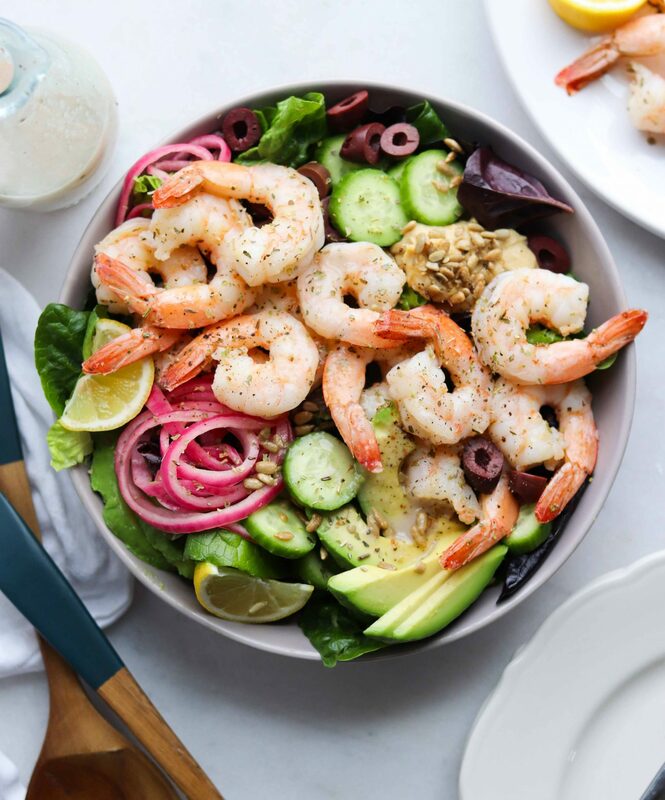 15 minute (Whole30 & Low Carb) dinner alert! Seafood is always my go-to for a quick weeknight meal (just check out my Bruschetta Salmon!). Seafood is great because it’s delicious, but one of my favorite things about it is it’s FAST. Shrimp takes about 4 minutes total to cook perfectly, so it works great with our busy evening schedules. Like yesterday, for example – I ran from school pick up to a work meeting to the grocery store to home, and I was SO thankful to have some shrimp defrosted for dinner. 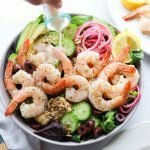 I made a big Whole30 compliant Greek Salad to share with my husband, then topped it with lemon-oregano shrimp, plenty of other crunchy stuff, and a homemade red wine vinaigrette. So simple and totally done in about 15 minutes flat. 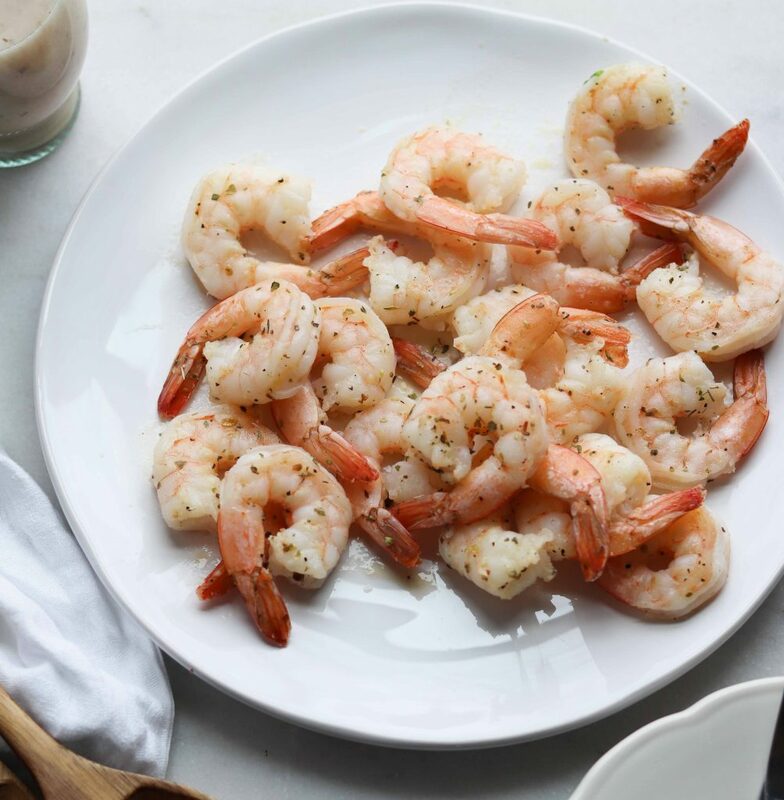 Shrimp quickly sautéed with oregano, salt, and a squeeze of lemon. They’re ready to go in about 5 minutes flat and the perfect way to top Greek Salad! My husband and I always joke about this thing we saw on TV once called The Olive Theory. It’s this theory Ted Mosby from How I Met Your Mother had, that when one person in a couple loves olives and the other hates them, they’re a good match. Don’t read too much into it, but it just so happens to be the case for me and my husband. He loves them, I hate them. And every time he eats olives we joke about it. So when I was making a Greek-style salad to share with him, and he asked for olives on top… I was like… uh… okay…. and I threw a few on top. I kept them all to one side though, just to make sure no taste of olive would creep its way into my mouth! That’s love, isn’t it? I added a few other crunchy toppings like my sugar-free pickled onions, because I always have them my refrigerator — and cucumbers and sunflower seeds, then the rest of a sliced avocado I had on hand. I made a fast homemade Red Wine Vinaigrette the other day, and I really do love this recipe. 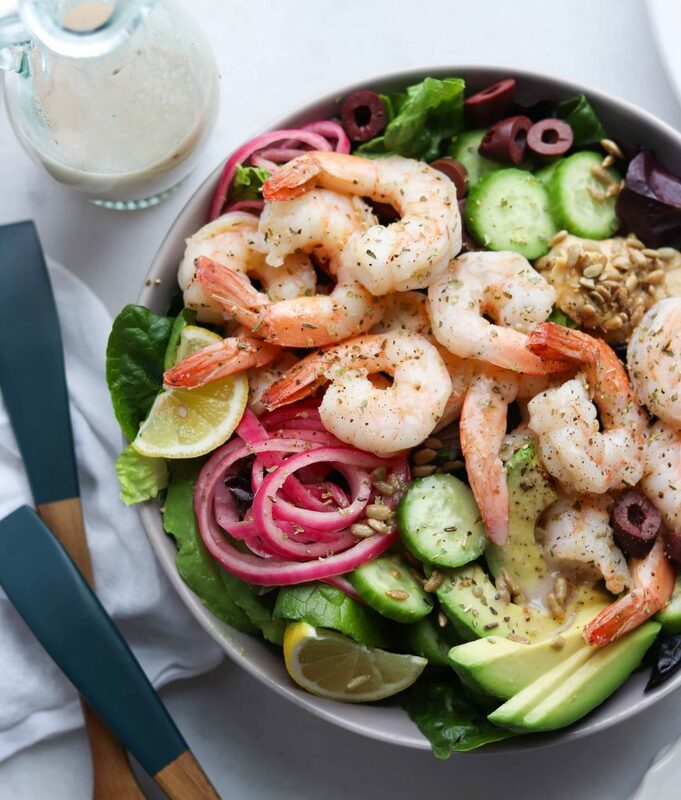 It’s definitely more versatile than just a Greek Salad. I’ve been putting it on collard wraps and all sorts of stuff this whole week. It’s just got so much brightness to it with fresh lemon juice. Try it out and let me know what you think, would ya? Whisk all ingredients together and season to taste with salt and pepper. Pat the shrimp dry with a paper towel and season it lightly with salt and pepper. Add the shrimp to the pan and cook 1-2 minutes per side. Once they’re pink through and no longer translucent, they’re done. It happens fast, so watch closely! Remove the shrimp and set it aside on a plate. Give it a squeeze of lemon juice and season very lightly with oregano and salt. Take a bite of one and see if it’s seasoned enough. Add the lettuce to a large bowl. 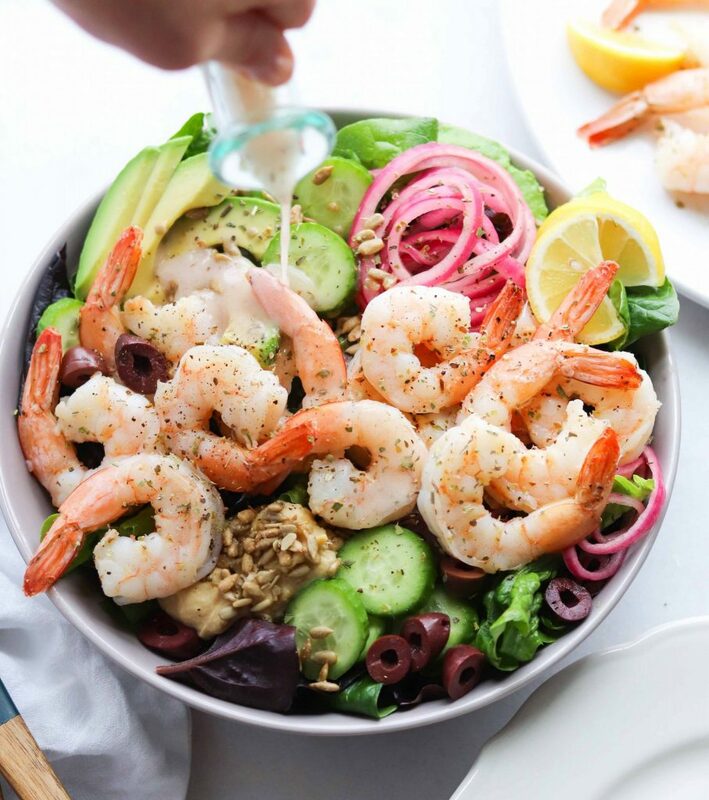 Top the salad with sliced cucumbers, olives, pickled onions, sunflower seeds, avocado, and shrimp, and dress lightly with the red wine vinaigrette. 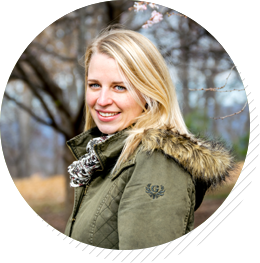 Looking for more Whole30 weeknight deliciousness? Check out my recipe for Easy Chicken Fajita Stuffed Peppers or Orange Sesame Chicken & Broccoli! The first ingredient for the vinaigrette says “1/3 cup red wine vinaigrette” – that should be vinegar, right? Quick and Easy. My kind of recipe! Thanks!